Thursdays mean that it's time for another Read Aloud Thursday at Hope is the Word. Or, at least, it's time for me to participate in one again! I'm starting to feel like I should tell you about the picture books we read when it comes to Read Aloud Thursday, but now that Bookworm1 has graduated to chapter books, I'm stuck on this idea that we must talk about Big Books. That's really not fair to my younger two, one of whom is entrenched in picture books and the other who has finally come 'round to the idea that Books Are Cool. It takes longer to read a chapter book and so I don't always have a Read Aloud Thursday post even though I really, really like participating in this event. So I'll do that. Next week we'll talk about picture books. OR we'll talk about the chapter book which we are reading right now. Which one is that, you ask?? It was the day before the first day of fall and the sky was overcast. (Hold back your snarky remarks about how the sky is always overcast in Oregon!) We all were in various stages of health, having passed a slight the-air-is-turning-cooler-cold around the family. I know that one ought not to think about filling your children with sugar when they are sick but when you've been housebound for days, you start looking for pick-me-ups. 1. Shortbread Cookies which my friend brought back from Scotland for our family. The foreign cookies from Mrs. D were received very well. She also told me that there are fewer calories to deal with if you share them with the children which is a truth that cannot be denied. 2. Hot chocolate in fun cups. 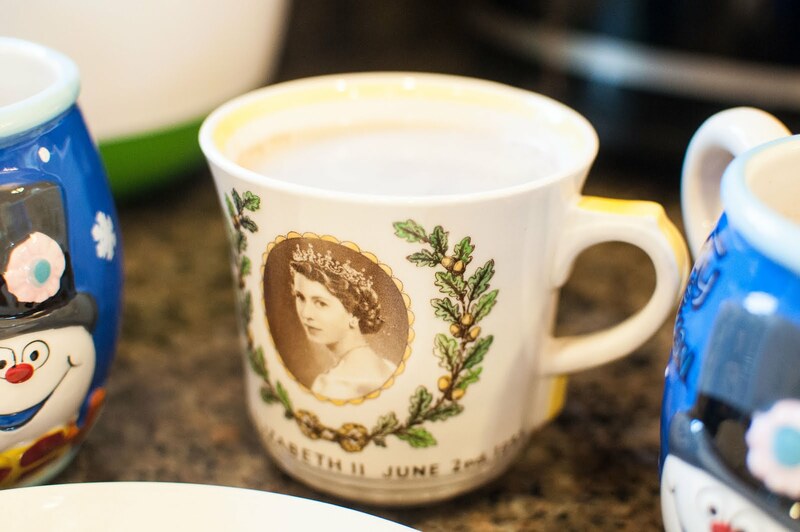 The boys have Frosty the Snowman cups and I had my commemorative Queen Elizabeth II mug which my mom gifted to me. Frosty and the Queen do make an interesting pairing, I'll grant you that. But we were all happy. 3. The Strictest School in the World: Being the Tale of a Clever Girl, a Rubber Boy and a Collection of Flying Machines, Mostly Broken (The Mad Misadventures of Emmaline and Rubberbones). Yes, YES, my friends! I decided it was high time to introduce Bookworm1 (specifically) - age 6 this month! - to this awesome story. (Read my original review HERE if you like.) I've been waiting for this day and the day has come. And we are laughing and we are enjoying ourselves just like I have long imagined that we would! Oh, yes, we are! 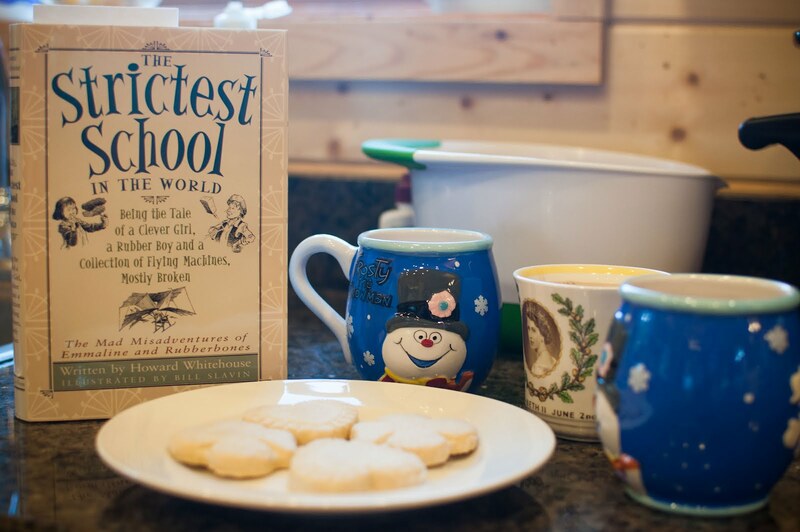 To refresh your memory: The Strictest School in the World: is like Wodehouse for kids. Only it's not just for kids. It is clever and witty and therefore it is fit for people of all ages. Re-reading this book is a treat and a half for me and I love sharing it with my kids! It's a perfect fall read and I'm so glad that we've begun this journey. While Bookworm1 might not be tracking with every single detail, I explain as we go along. And whatever he misses can be enjoyed during re-reads in the future. For this book is meant to be re-read and enjoyed! So, thank you again, Mr. Whitehouse, for the fun! Hmm, I'm interested. It's always nice to know that there are still worthwhile kids' books being written. @Tim - You and your kids would LOVE it! I'm willing to place large bets. Sounds fantastic! Going on my TBR list for me and my boys.